Harry Potter and the Cursed Child  set a new box office record on Broadway last week. 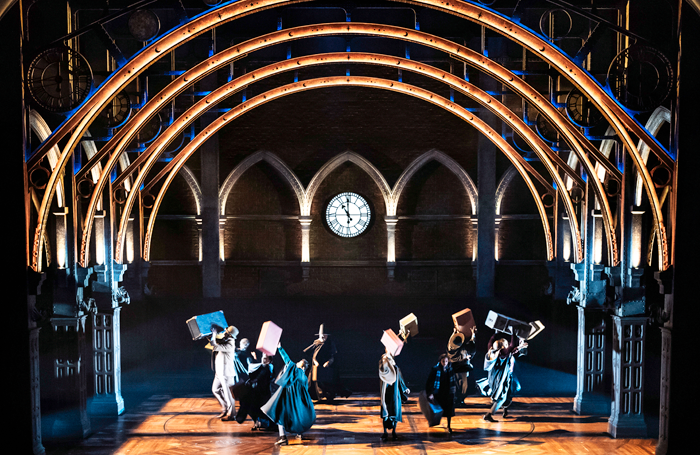 While box office records seem to be coming ever faster and more furiously in these days of dynamic pricing – the basic economic principle of supply and demand has belatedly reached Broadway – Potter’s achievement is one of particular distinction. In grossing $2.1 million, while still in previews, the two-part piece achieved the highest weekly gross for a play in Broadway history. It is not unreasonable to expect that it will break its own record in the weeks, months and certainly years to come. The achievement of Cursed Child came in a week when it was one of five shows on Broadway to gross more than $2 million. It was joined in the $2 million club by Wicked, The Lion King, Frozen and, at more than $3 million, Hamilton. While numbers like these raise the ongoing concern that with higher grosses come higher average ticket prices, there’s no denying that the economic effect on the field is significant, with so much more money in the coffers. After all, the number of seats available is largely unchanged, except at ATG’s the Lyric, home to Harry Potter , which actually removed seats as part of the venue’s reconfiguration for the boy wizard. The Lion King  is selling $2 million in tickets after more than 20 years and The Phantom of the Opera has soared past $1 million weekly after 30 years. For many, this would have been inconceivable only a few years ago. We may well be in the era where shows cost $1 million a week to run, but what does that matter if they can gross $2 million a week? After all, even Phantom’s director Hal Prince predicted in the 1970s that no show would ever run longer than Fiddler on the Roof. Phantom and The Lion King are both testaments to the power of tourism on the box office, since one imagines that anyone in the New York area who has wanted to see these shows would have done so by now. Of course, what these weekly reports don’t tell us is exactly how much each show cost to mount and, even more importantly, what each show’s weekly running costs are . We may well be in the era where shows cost $1 million a week to run, but what does that matter if they can gross $2 million a week? Certainly not every Broadway show will reach these rarified levels, as eight of the Broadway theatres have fewer than 1,000 seats. Although with a star of the right calibre – such as Mr Springsteen – ticket prices can easily erase the difference in earning potentials. However, it’s unlikely that there will be a parade of rock stars who can still fill arenas with tens of thousands of seats opting to play long-term residencies in a venue where a month of performances has as many available seats as a stadium on one night. As I wrote last May, the cumulative gross for the current Broadway season, which ends next month, will surely be higher than last year’s, and I expect that to be borne out. At the time, Springsteen on Broadway hadn’t been announced, and its repeated extensions have had a significant impact. Harry Potter catches only the last few weeks of the current season, so its effect will be fully felt in the 2018-19 season. There’s an old adage that says you can’t make a living in the theatre but you can make a killing. Perhaps the corollary for today is that while the number of bodies on Broadway is still limited by the size of the theatres, the killings are really piling up, week after week after week. Lynn Nottage, who won the Pulitzer Prize last year for Sweat, returns to the Public Theater with her newest work, Mlima’s Tale, opening on Sunday. The four-actor play examines the illegal ivory trade by focusing on its title character, an elephant exploited for its value. Jo Bonney directs. Lerner and Loewe’s classic My Fair Lady returns to Broadway for the first time in 24 years this week, in a Lincoln Center Theater revival. It is directed by Bartlett Sher, who has had multiple successes for the company, including his forays into the Rodgers and Hammerstein canon. Lauren Ambrose and Harry Hadden-Paton play the musical versions of Shaw’s Eliza Doolittle and Henry Higgins in the show’s fifth Broadway run, opening on Thursday.